After 3 years of pondering, one cancelled race, and 3 weeks of scrambling to make up for a month of lazy (ok nonexistent) training, I finally did it! 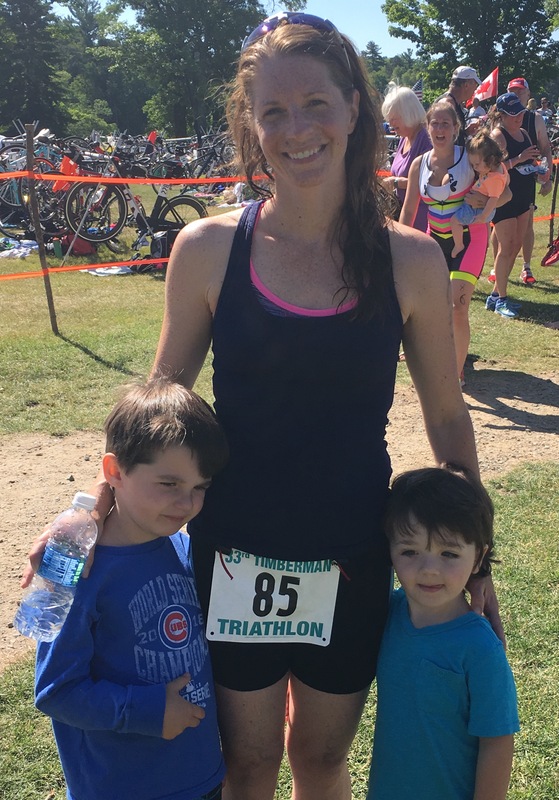 I completed my first triathlon. After many recommendations, I zeroed in on the Timberman in Cohasset. The weather was perfect. The sun was out, the lake was calm, and only a slight breeze. The morning was a blur. I was a nervous wreck. Tried to eat breakfast, but couldn’t. Stared at my bike a lot, and aimlessly dug through my bag looking for things I may have forgotten to lay out in my transition area. Race time! Thirty one minutes passed between the first wave going out in the swim and my own so I got comfortable chatting with a couple of nice women from my heat. It turned out that we were all nurses. After bonding over our ability to handle any bodily fluid it was our turn to go. I contemplated running out of the lake screaming but held myself back. The gun went off. I was trying hard to dolphin dive and not punch or dive directly onto the other swimmers. After finding my way out of the scrum it was apparent that the 30 minute wait was too much and I was out of breath and rhythm. By the first buoy I managed to get it together for a few moments before my goggles completely fogged up. I contemplated taking them off, launching them into orbit, and doing the Tarzan stroke the rest of the way. I eventually made it out of the water. Running on the grassed transition area also proved difficult and I was seriously questioning my decision making abilities at this time. What had I gotten myself into? I hopped on my bike and got going. I was proud of my 15 mph average speed, got into a good groove, and was feeling good. That was also about the time that approximately 388 of the 389 participants passed me and I was humbled by my paltry tempo. I was having a great time though! Bike finished. The run went better than I originally thought it would. I actually passed a few people! I did start to panic slightly because I had convinced myself that I had missed my turn-around and got on the Olympic distance path. Fortunately, I did not miss my turn and put myself into a higher gear for the way home. And by higher gear I mean running a 9:04 minute mile instead of 9:05 minute mile (basically fast enough to be a blur to bystanders). Near the finish line I ran into my husband and two kids. Having the opportunity to high-five them gave me an extra boost. My two-year old ran into the road screaming “mommy!” and nearly tripped the lady behind me. She casually remarked, “it’s fine, I’m not in a hurry as you can see,” which gave us all a laugh. I crossed the finish line in 1:25:14.5. My original goal was to finish the race, which then progressed to doing it under 1:30, which progressed to wanting to finish in the top 3 of my age group. I was 4th in my age group, but completed my other goals so I was elated. And also hooked.